A silver-gilt cloisonne and en plein enamel box, 4¼ in. (10.8 cm.) long. Estimate: 180,000 – 250,000 U.S. dollars. Photo: Christie's Images Ltd 2012. NEW YORK, NY.- Christies sale of Russian Works of Art on Monday, April 16 in New York features one of the strongest offerings of cloisonné enamel to come to the market in years, including works by the master craftsman, Feodor Rückert, and the house of Fabergé. The auction comprises fresh to the market works from distinguished European and American private collections and includes more than 175 lots of silver, enamels, objects of vertú, porcelain and bronzes, with a pre-sale estimate of $3  4.3 million. Highlighting the exceptional section of cloisonné enamel is a silver-gilt cloisonné and en plein enamel casket by Feodor Rückert, from a Maryland private collection (estimate: $200,000-300,000). An excellent example of Rückerts late work in the Neo-Russian style, the cover panel of this exquisite casket depicts Tsar Ivan the Terrible Admiring Vasilisa Malentieva, after the painting by Grigory Sedov. Considered to be the artists masterwork, the original painting was executed in 1875 and now hangs in the State Russian Museum in St. Petersburg. 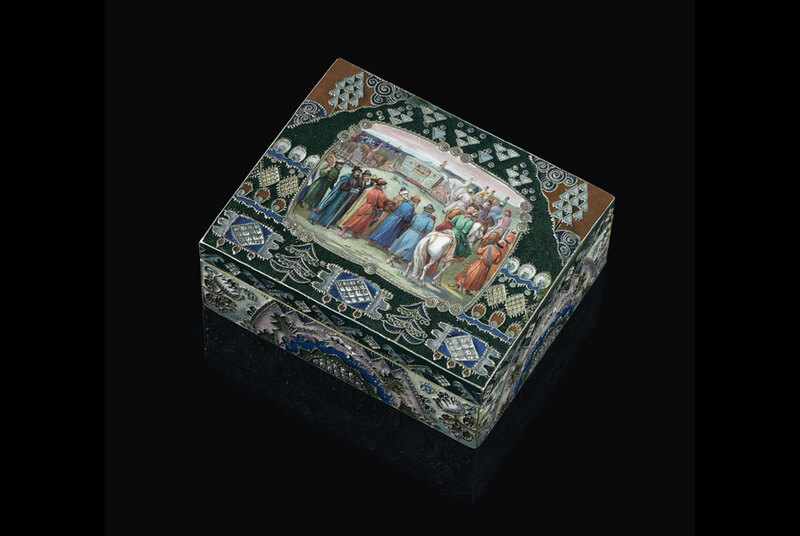 Leading the works by Fabergé is a silver cloisonné and en plein enamel box (estimate: $180,000-250,000), which is set with a fine enamel plaque depicting Departure of Tsar Alexei Mikhailovich for the Hunt, after the painting by Victor Vasnetsov. The box is one of many lots of exceptional enamels from a New York private collection. The strong selection of Fabergé is also highlighted by a jeweled three-color gold, silver-gilt and guilloché enamel desk clock by the workmaster Henrik Wigström, that was presented to Baron Marochetti, the Italian Ambassador in St. Petersburg between 1886 and 1900 (estimate: $150,000-250,000). Other exquisite works by Fabergé in the sale include a jeweled silver-gilt massive covered tankard by the workmaster Stefan Wäkevä from a Georgia private collection (estimate: $60,000-80,000); a delicate jeweled gold-mounted agate and diamond-set bonbonnière by the workmaster Henrik Wigström, from a private collection, Houston, Texas (estimate: $40,000-60,000); and a jeweled parcel-gilt silver-mounted oak presentation desk that was presented to Allan Bowe, Peter Karl Fabergés business partner, by the employees of the firms Moscow branch to mark his retirement in 1906 (estimate: $25,000-35,000). A highlight from the Russian Imperial court is a jeweled gold maid of honor badge by the court jeweler Hahn (estimate: $70,000-90,000). The badge was presented in 1904 to Countess Olga Alexandrovna Nieroth (b. 1876), maid of honor to Empress Alexandra Feodorovna, whose family had a distinguished record of military and civil service to the Russian empire. Other sale highlights include a silver and cloisonné enamel vodka set by Feodor Rückert from New York private collection (estimate: $60,000-80,000), a silver and en plein enamel large kovsh retailed by Nemirov-Kolodkin from a Colorado private collection (estimate: $40,000-60,000), as well as a wide selection of 19th century bronzes from Evgeny Lanceray and Nikolai Lieberich. Philip Mould & Company presents "The Painted Face during the Age of Photography"